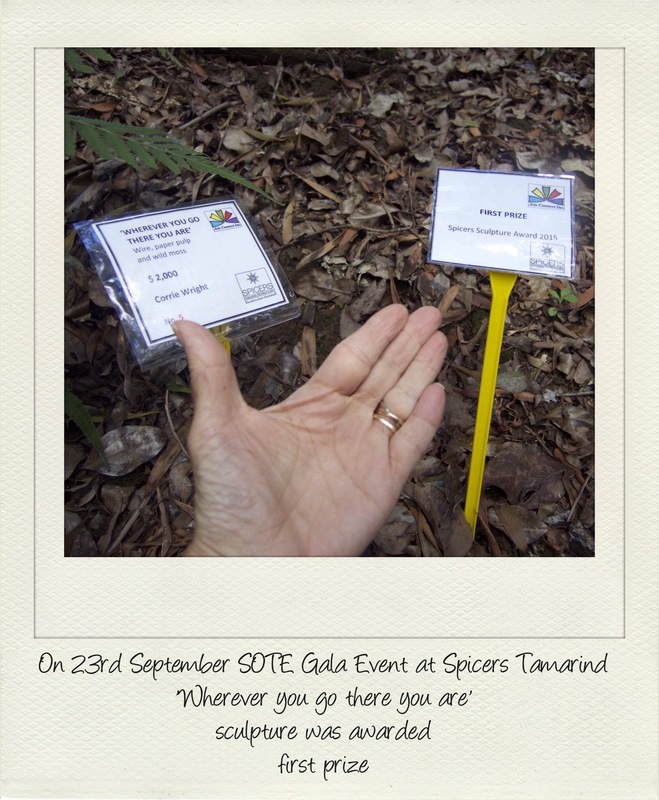 by Tamsin Kerr – wherever you go there you are! 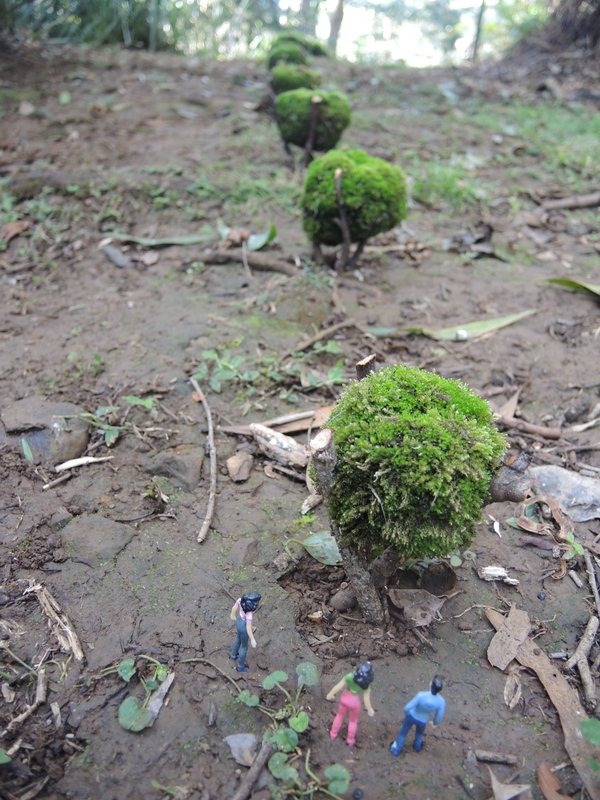 It is a small performance of gathered moss shaped into line of bowls along a mostly untrodden path at the bottom of Spicers Tamarind Retreat in Maleny. The place is steep, dank, full of the sound of rushing water from the downhill waterfalls. 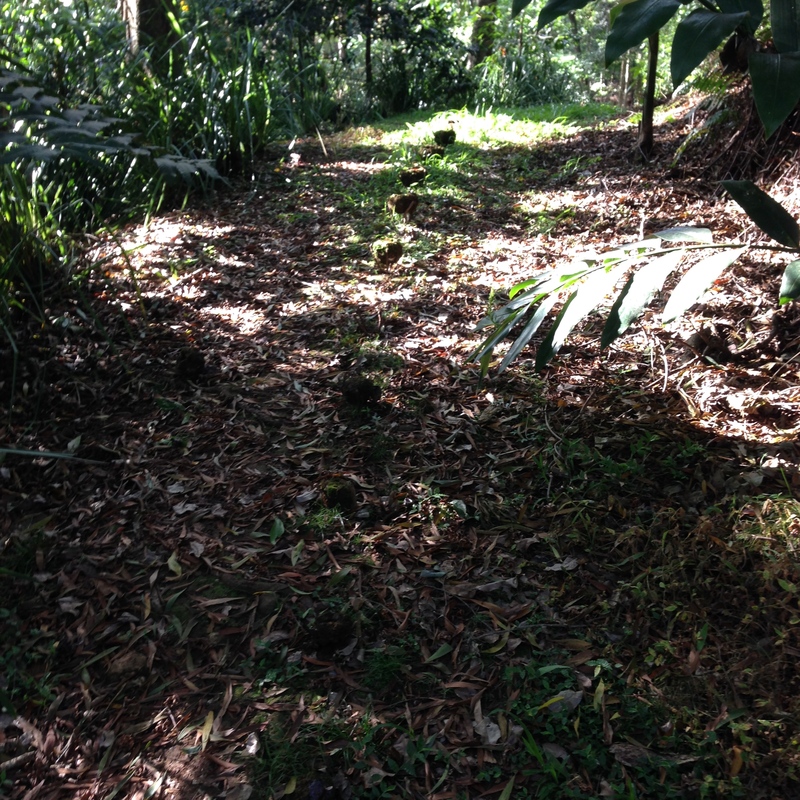 The path runs near the bottom of the property. The moss bowls are always changing; by the time of these photos in mid December, some have closed over, already overflowing within their own microworlds, others have been removed. More will go over the next few months until all that is left is the memory of the art and many travelling moss spores seeking new habitats. The place remains: a rainforest country, always damp with slippery muddy paths and lush green dankness. A place for human silence and natural solace. 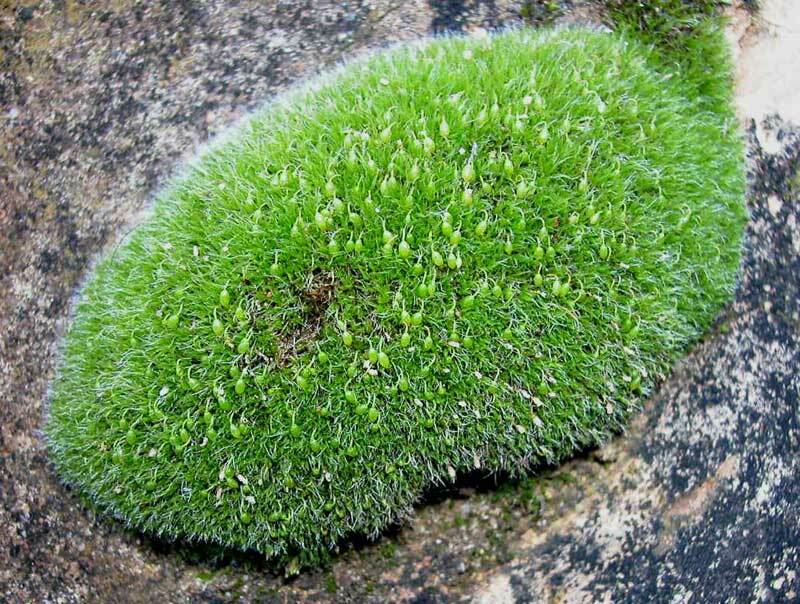 Moss is the oldest terrestrial plant, requiring neither roots nor complex structures to survive. 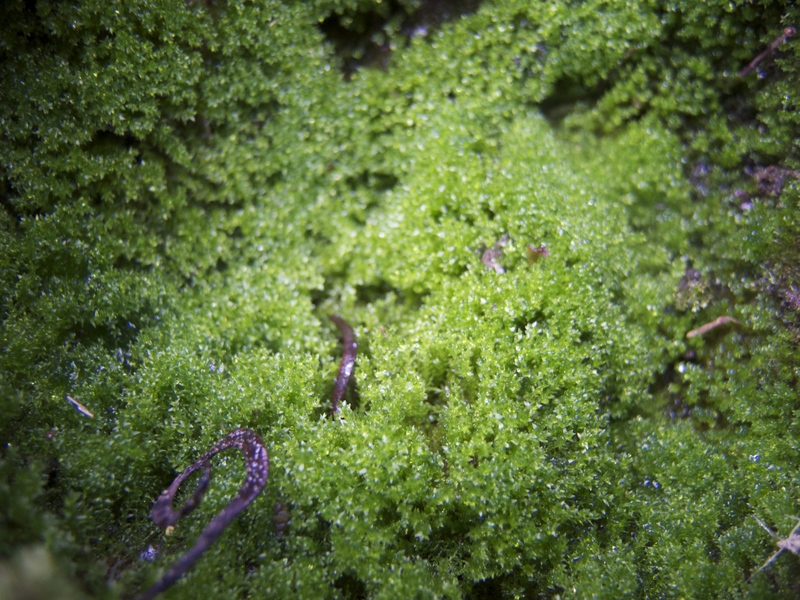 It thrives in damp places and creates microhabitats for many other small flora and fauna. A complete and complex beauty emerges when we take the time to kneel and examine these simple plants. 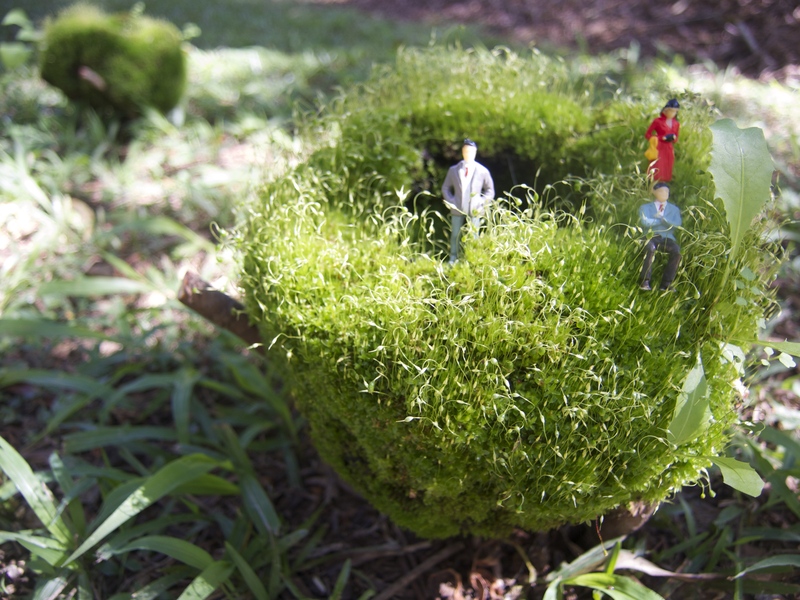 Corrie’s work links the lives of moss to that of the Buddhist alms bowl; another humble object that conveys the everyday ritual of non-attachment and gifting. It is the negative space of the bowl that is valuable: able to be filled, open to possibilities. 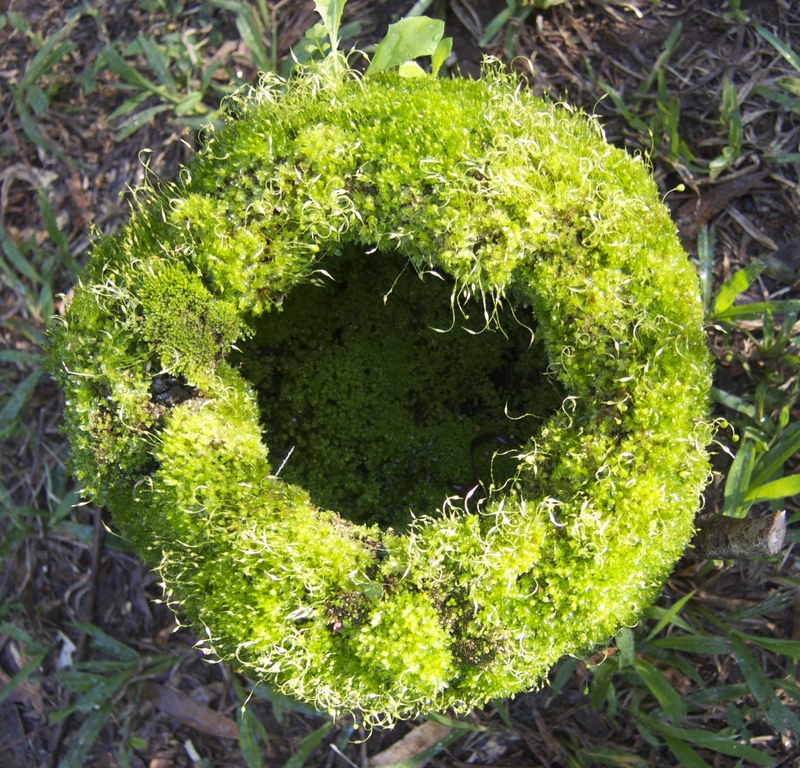 The idea for these moss bowls had taken root the previous year as Corrie sat embroidering a scar in a tree at the same site. Making such a minute work required long sitting and stillness; so, unlike a rolling stone, she began to gather moss, and went on: collecting and researching moss over the following year. Corrie has long been interested in environmental art, in the performance and process of making as much as the product. She has stitched leaves together on her pedal sewing machine while talking with the audience who literally give her the power to continue on the attached bicycle. She has camped for days at sites to understand the sense of place before she decides on the artform that best reflects its genius loci. There remains a slight doubt in the minds of both artist and audience as to the value of ephemeral and environmental art. At the initial meetings of artists, Corrie wondered for a moment how she fitted in with artists such as Hew Chee Fong (second prize) or Elli Schlunke (people’s choice) who were making stone and mammoth works, and when she heard she had won, her first thought was how brave the judges, Jude Turner, Christine Ballinger, and Kathleen Hunt, were to make such a choice. But over time, their decision and the work’s validation sits well, not only with the small beauty of the work, but also with the direction we need to take, the paths less travelled. “Sculpture on the Edge” deserves its epithet. Ephemeral art has held a place on the edge of mainstream practice but rarely is brought or valued as public sculpture. Andy Goldsworthy prefers his rainshadow works over his large stone sculptures, but he cannot make a living from such short performances. Art and architecture prizes tend to go to the individual who contributes a monumental heroism to our cityscapes. But this year, Alejandro Aravena won the Pritzker with a community designed affordable housing humble piece and Corrie Wright won the Sculpture on the Edge with an even more lowly gathering and tending of moss. The world is changing, and we are valuing the beauty of the everyday and the ephemeral, the gradual processes of art in nature, and the connections we make in understanding such works. Artists and architects are listening more to the site and its community – human, plant, animal, stone, and water; the resulting partnerships let this more-than-human community speak in its many voices. And by attending such performances of place, however short-lived, we are valuing this connection to the locales we inhabit. 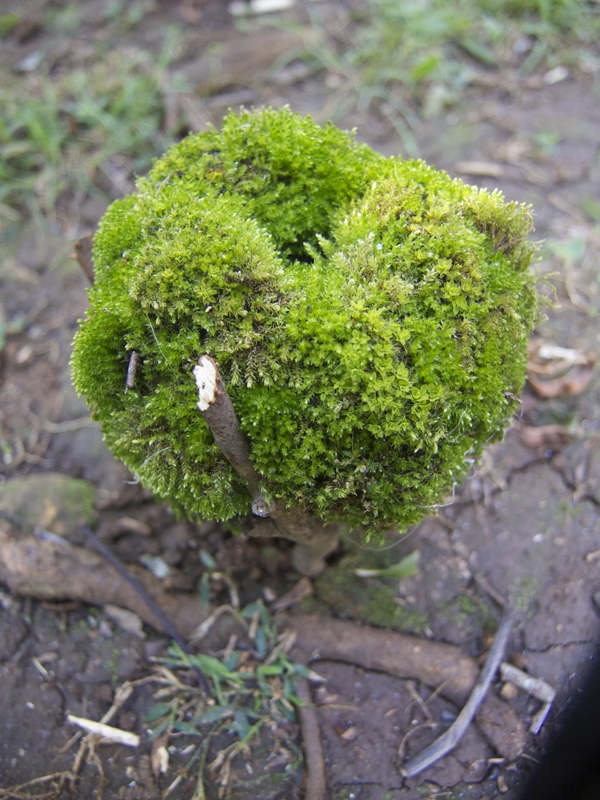 Perhaps the world is unfurling change in the same way as Corrie’s gathering of ever-changing moss? Perhaps hope lies in that alms bowl shape of negative space, in the daily ritual of tending to place? 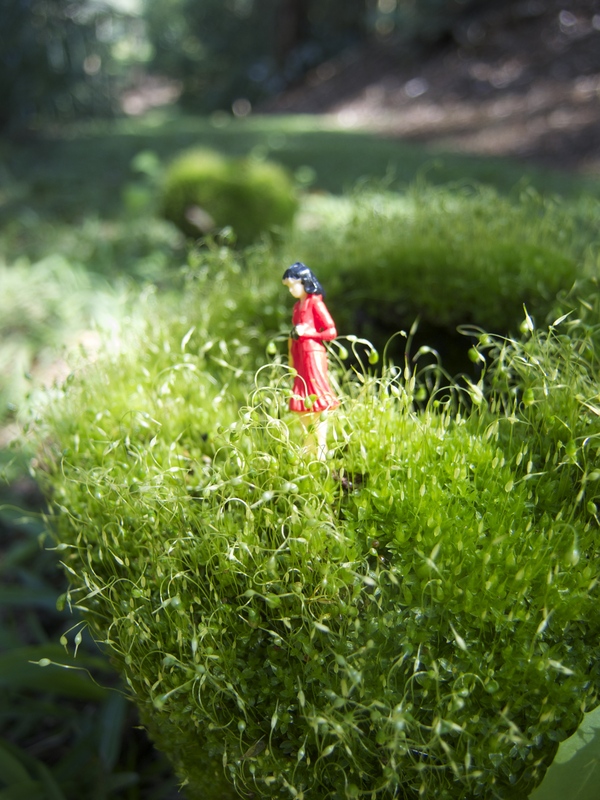 Corrie’s work not only connects us to the everyday wonders of moss, but also inspires us to make our own partnerships with the small worlds that surround us. We might all rebuild such play and ritual in the bottoms of our garden, using moss to dress the wounds opened by our too-fast pace. With humans returned to their natural ecology, the world turns more freely. Corrie Wright’s slow and patient art using the small and often overlooked is worthy of louder celebrations as we learn to inhabit these creative lessons in site-specific transformation and connection. 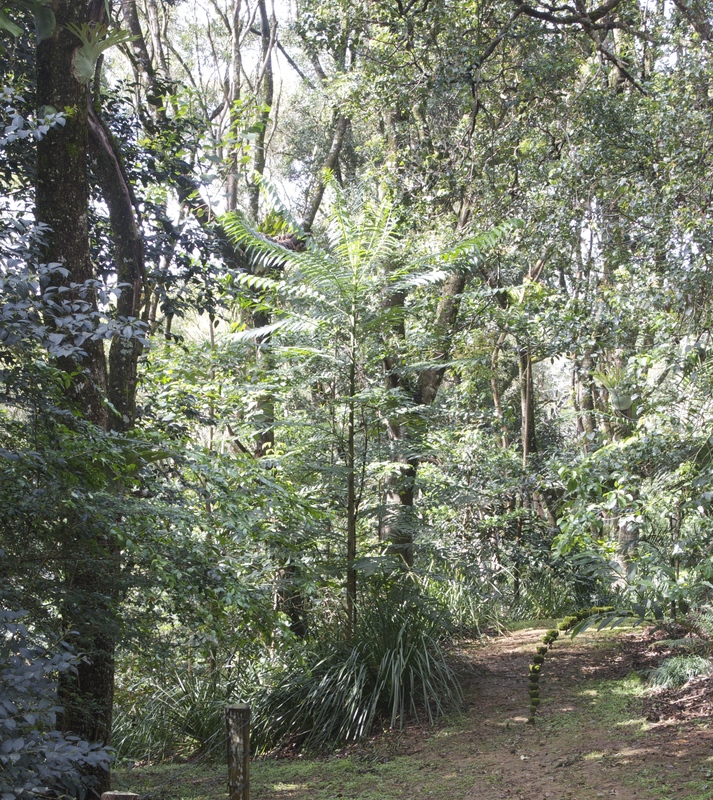 Dr Tamsin Kerr is a writer and artist as well as running the Cooroora Institute on the Sunshine Coast of Australia: sharing the song of the earth through creative practice.